Learn decision modeling with DMN in our upcoming live online training class, March 27-29, 2018. This 3-part online live training class taught by leading expert James Taylor, CEO of Decision Management Solutions, will prepare you to be immediately effective in a modern, collaborative and standards-based approach to decision modeling. You will learn how to identify and prioritize the decisions that drive business performance, see how to analyze and model these decisions, and understand the role these decisions play in delivering more powerful information systems. Each step is supported by interactive decision modeling work sessions focused on problems that reinforce key points. All the decision modeling and notation in the class conforms to the DMN standard, future-proofing your investment in decision modeling. 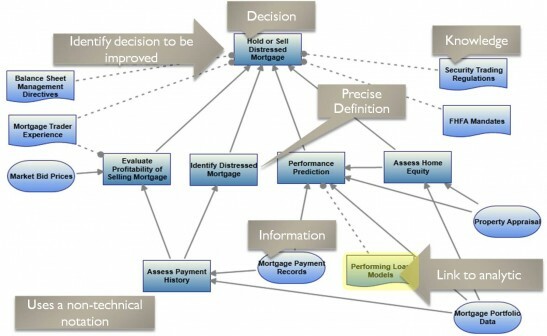 Decision modeling is also a Technique in v3 of the BABOK® Guide by the International Institute of Business Analysis (IIBA). Click here for more information and registration. Early bird pricing is available through March 1, 2018.